Arc House Defined by an arc, this gently curving house uses passive solar design to capture the sun’s energy during the day and then store it in its interior mass to stabilize interior temperatures, even in cold climates. Based on ancient Native American designs, this Earth Lodge with living roof will keep you cozy and warm even in the harshest climates, because it is earth-sheltered. South-facing windows and a skylight over the kitchen ensures ample daylighting. The Earthworm Studio was custom designed for a client who wanted total concealment by building into a hillside and using living roof and living walls. They also requested minimal environment impact and lowest possible cost off-grid design. 662 sq. ft. interior including bedroom loft, 1 bath; footprint: 18.5′ x 39′. This one and a half story Hobbit House features drop-down stairs that lead to a spacious loft, wood stove heating, and modern kitchen with pantry space for Hobbit food. The undulating thatch roof or living roof is created by varying the knee wall height above the bond beam. 24-6″ diameter with 471 sq. ft. interior, 471 sq. ft. loft, total 942 sq. ft. interior, one bedroom, one bath. This modern Solar Pit House is based on the traditional pit house. The construction is much the same. Additional ‘modules’ have been added to create an elongated rectangular design for added living space and windows added on the south for solar gain. This plan is available for free! T his unique earth-sheltered Spiral 2 design includes a large grow bed, exposed timber ceiling and living roof. Ample light is provided by the window wall next to the grow bed, window and door glazing, and suntubes. Distinguishing features include two bedrooms, masonry two-way fireplace, covered porch and cool pantry for storage of food. This Triple Roundhouse Cluster design connects three sloped roof roundhouses and adjoining closets to create a unique roundhouse cluster design that is earth-sheltered on three sides – east, west and north – with a sunny courtyard on the south. 785 sq. ft. interior, 2 bedroom, 1 bath; footprint: 28′ x 58′ plus buttresses. Zero Energy One is a major step forward in sustainable housing. This revolutionary design features zero net energy use, extremely low ‘near zero’ embodied energy and extremely low cost. This design is the result of years of research in energy efficiency and low cost, alternative building methods. Zero Energy Two is similar to the Zero Energy One plan above, but it has two bedrooms and 2 bathrooms, as well as separate airlock entries into the bedrooms, bermed mechanical room and pantry. There is even a built-in solar oven in the kitchen. Zero Energy Four is a four bedroom version of the Zero Energy home series. This revolutionary design features zero net energy use, extremely low ‘near zero’ embodied energy. 1,693 sq. ft. interior plus 901 sq. ft. interior greenhouse, 4 bedroom, 2 bath; footprint: 40′ x 109′ not including cisterns or optional garage. I love your site, I love your designs, and I love your philosophy of getting info out there to propagate natural building. We are planning to build an earthbag house in New Mexico (probably a hybrid between Zero Energy One and Zero Energy Four — a small house with full frontal greenhouse). I am a bit daunted that the plans do not include plumbing and electrical details. I can easily understand why they don’t (trying to get more designs out there without multiplying the work tenfold; different builders having very different plumbing and electrical needs, etc), but as new builders I don’t know if we’ll have the wherewithal to plan that all appropriately. We want to build a passive & active solar house with catchment, the ability to supplement by wellwater if it turns out we need to (annual 10″ rain high desert site), and a greywater system. The electrical & plumbing will likely be pretty complex. Is that the kind of thing that a firm like PSE can do for us? Is that the kind of thing we get for the $5,500 cost of Michael Reynolds’s Earthship plans (we have no desire to pound thousands of tires)? Is that the kind of thing you could help us with at the per-hour-consultant rate (if you are still doing that)? I think we might be able to do some initial effort at figuring that out (we’ve done a fair amount of plumbing and electrical work on our conventional houses), but we for sure would want outside eyes before we go ahead. And if we don’t have to create the wheel when others have done similar, we’d likely jump at that! Thanks so much for all of your great work. 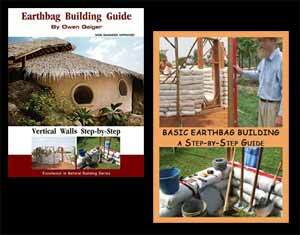 Read my earthbag ebook and you’ll see how simple plumbing and electrical can be. It’s 99% identical to what most people do in their conventionally built stick frame houses. Yes, PSE can add a drawing or two showing plumbing and/or electric, but once you realize how easy it is then there’s no reason to. Ex: chat with an electrician guy at Home Depot, etc. Trade work or buy him a little gift for 20 minutes of his time. Print the plants and he can mark where things go on the drawing. You get the idea. In other words, you do all the work, but get a professional to answer a few questions here and there. Get an illustrated library book if needed. The hardest part would be hooking up the solar. But I’m sure they provide wiring diagrams and instructions when you buy it. Millions of average people build their own homes and do these things so I’m sure you can to. It just takes a bit of research and a little extra effort. The payoff is huge savings. Another idea is to volunteer on a Habitat for Humanity house when the electric and/or plumbing are put in. You can choose when to volunteer. Chat with the workers, help out, take photos and notes, etc. Where there’s a will there’s a way. I have put together information on the criteria of home I am getting ready to build. Can you email me your address so I can send you the request for you to review construct a building plan and where to send payment to? Thank you very much for your website. My email is at the top of every page under About Us. I’ll take a quick look for free. I would like to know if I would need to dig a rubble trench if building on a rock base of undisturbed ground? What would be the best type of foundation for this type of building on this type of land? It is very rocky. Can the first 4 layers be of gravel bags, strawbales placed around the building perimeter, Heavy 6-12mil plastic around bales and earth wall and drain placed around the bag building, bermed with earth? The earth home is a 28 foot circular diameter 2 story with 1st story mostly bermed. Does something like this seem feasible? Yes to everything except the part about using bales around the perimeter. What for? Flood diversion? Not clear. Use plastered earthbag retaining walls and swales to divert runoff. So yes, you can build right on the rocky ground with gravel bags if there are no codes. The Strawbales are for insulation to keep the home at a comfortable temperature. Are they not needed? I live in the Fort Worth Texas area. Not needed. Maybe build up a 12″ – 24″ sloped earth berm around the house plus use wide roof overhangs. Can you recommend a builder who can be hired to build a home with a huge bunker underneath? Thanks! You’ll have to find someone local. Our earth home was built in 1985 using bentonite clay over the Flexicore concrete planks. The garage roof started leaking so we are replacing it with a rubber roof. We had used standard landscape fabric between the rock and soil layers but it has degraded. Do you know of a better type of landscape fabric that will keep the soil from leaching into the rock (drainage) layer? Hopefully the new rubber roofing can be installed within 2 weeks, so appreciate a quick response. Thank you. Talk to local engineers and find out what type of geotextile fabric they recommend. It partly depends on what’s available and affordable in your area. In a movie I watched recently, 10 Cloverfield Lane, one of the characters builds a fallout shelter underground in Louisiana. Many people have said this is unfeasible due to the high water table there. However, I’ve read that underground shelters can be waterproofed. What’s the truth? Almost everything is possible. It’s a matter of how much will it cost and whether or not it’s practical. In general, it’s not practical building underground in high water table areas. Louisiana certainly is in that category! What if home site is north facing? Any design suggestions for steep (~25%) hillside earth-shelter (“near-underground”) design considerations? Site’s is high pasture, ~2000′ in WV. There must still be some energy benefits worth economics of embedding one’s home into the hillside. Suggestions? I’m an interior designer in Thailand and an old client of mine is doing a yoga retreat center in Pai (Mae Hong Son) and contacted me to help with designs. Though we didn’t start out thinking in this direction, after finding your work, our minds have changed. I wonder if you are presently in Thailand and if so where? Maybe I or we could pay you a visit, see some of your work, and get your input on what we are looking to do. We are both very impressed. Thanks and have a wonderful day! Where’s the underground stuff? everything listed as “underground” is above ground. These are earth-sheltered. You can vary the amount of earth sheltering from a berm as shown in these drawings to completely earth sheltered. It’s your choice. More plans at Earthbag House Plans include complete underground shelters. What about earthquake safety? What additinal structural beams are added? Also humidity. We live in Costa Rica. We would put on a high roof, not a flat one, to send warmer air up. Often the upgrade to disaster resistant structures consists of rebar pins down through the bags and a few other simple steps since earthbag walls are already very strong. I am wanting to build something very simple, unique, roomy, airy, like to have windows to have inside plants. Love lots of light, plan on a Big room- living & dining w/kichen. then master bedroom,bath. and a quest bath & laundry. Simple, Simple. Don’t want it to be tiny like 4-500sq.ft. Looking at maybe around 12oo.. still small, but plenty big for me. No Halls, few walls. You can build any size and design you want. Start small though because earthbag is labor intensive. Please keep me updated. I am building a rehab center in Alabama using underground construction. We are working on building an underground house as part of our sustainable community. We live and work in northern B.C. Do you have any knowledge of housing for zone 3 buildings underground? We would like to involve you in our vision and add you as a resource. We are working on several projects that make the knowledge you provide very valuable. Thank you and let me know how we can collaborate deeper. You can email me your proposal or project info. My address is at the top of the page.